On Thursday, January 28, 2016, Harvard Law School’s Center for Health Law and Policy Innovation (CHLPI), Community Servings, and Massachusetts General Hospital will come together in Florida for The Seventh Annual Medicaid Innovations Forum to examine how the provision of medically appropriate foods play a critical role in outcome-driven, cost effective healthcare models. The panel will be moderated by Neighborhood Health Plan of Rhode Island. The panel will feature distinguished speakers and panelists as they discuss data and cutting edge research to make the case for Food is Medicine and how nutrition programs are being integrated into the healthcare system to improve population health. The forum gathers hundreds of representatives from states, health plans, and solution providers to explore policy strategies to leverage the quality of care, reduce costs, and successfully serve the growing Medicaid population. Read the full press release on the Seventh Annual Medicaid Innovations Forum. The January 25, 2016 issue of POLITICO’s Morning Agriculture feature, a daily briefing on agriculture and food policy, included a quote from Emily Broad Leib, director of the Harvard Food Law and Policy Clinic (FLPC), on food waste initiatives that are garnering attention from the business community. Read POLITICO’s Morning Agriculture feature in full. Image from 99% Invisible website. Emily Broad Leib, director of the Harvard Food Law and Policy Clinic, can be heard on the January 12, 2016 episode of the radio show, 99% Invisible. 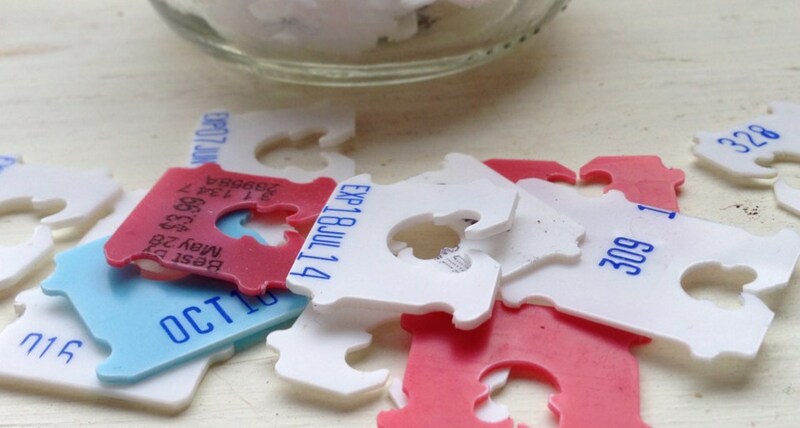 The episode, titled “Best Enjoyed By,” examines the related issues of expiration labels for food products and the increase of food waste nationally, and the history of food labeling. The episode also refers to 2013’s “The Dating Game: How Confusing Date Labels Lead to Food Waste in America,” a report on date labels by the Harvard Food Law and Policy Center and the Natural Resources Defense Council. Emily Broad Leib is joined on the show by Doug Rauch, founder of The Daily Table. The Child Nutrition and WIC Reauthorization Act (CNR) is the centerpiece of federal child nutrition policy. Following a fall legislative session in which progress on the CNR repeatedly stalled, Senate Agriculture Committee leaders promise that it will be a top priority as Congress returns this week. The CNR takes place every five years and establishes the funding and policy for key programs, including the National School Lunch Program, School Breakfast Program, Summer Food Service Program, and Special Supplemental Nutrition Program for Women, Infants, and Children. The last CNR, the Healthy, Hunger-Free Kids Act of 2010 (HHFKA), expired on September 30, 2015. Through a continuing resolution, the Act continued in its current form and is now up for reauthorization. The HHFKA marked a breakthrough in improving the nutritional quality of federally-supported child nutrition programs; among other things, it updated school meal nutrition standards for the first time in over 15 years. 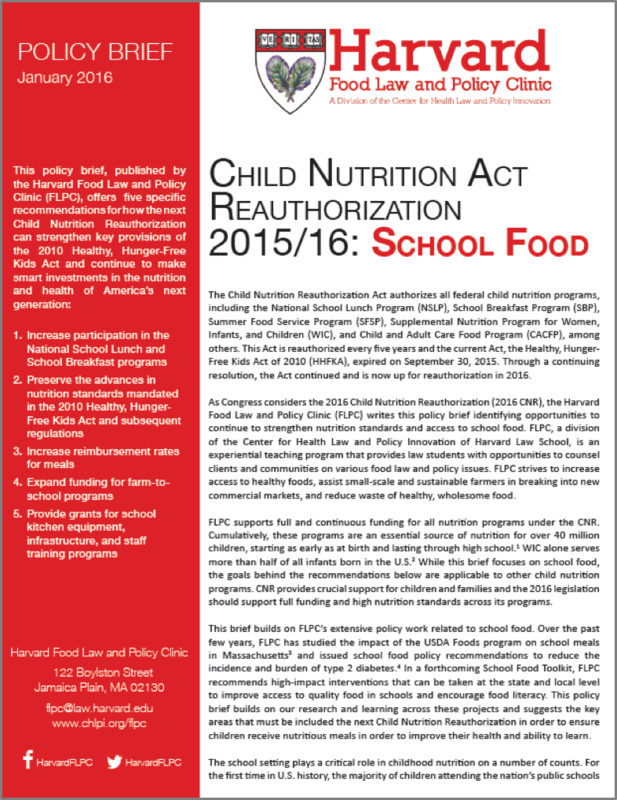 Today, the Harvard Food Law and Policy Clinic (FLPC) released a policy brief about changes to the CNR that can support healthy school meals. While FLPC strongly supports full and continuous funding for all programs authorized under the CNR, the brief focuses on school food because of FLPC’s extensive policy work in this area and the critical importance of the school setting. Children who participate in school meal programs consume, on average, half of their daily calories at school. School meals also serve an important educational purpose, encouraging children to cultivate healthy eating habits and preferences that will stay with them throughout their lives. provide grants for school kitchen equipment, infrastructure, and staff training programs. Collectively, these recommendations help to ensure that more children are able to consume better meals. Nutritious meals provide countless benefits in both the short and long-term – from supporting children’s cognitive, physical, and emotional develop to reducing their lifetime risk for diet-related diseases. These benefits are, of course, important on the individual level, but they also carry substantial public policy implications such as improved educational outcomes and reduced healthcare spending. To learn more, check out FLPC’s CNR Policy Brief.